I was excited for the folks at Locanda de Gusti when I noticed they were working on the set up of a new pizzeria just across from their main Dalry Road restaurant. Since their move from Broughton Street, where they were constantly battling to fill a large restaurant, they’ve really flourished in more fitting surroundings for their Neapolitan style and a pizz place felt like a really good next step for them. 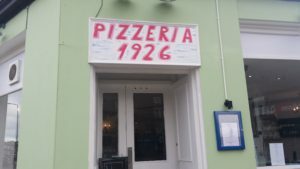 The new place is called Pizzeria 1926 and opened just a few weeks back. I’d visited in its first week and found things pretty shaky. Their seafood sharer starter was pretty uninspiring and their pizzas not quite there yet, particularly in terms of topping combos. I made a note to visit once they were a little more settled. I live quite nearby so took the opportunity to pop in for an impromptu lunch between shopping stops. The place is in an informal cantina style. It’s light and bright, quite compact and feels quite homely and welcoming. The menu retained the same pattern as before with simple sharer starters then a selection of pizzas including a calzone and a deep-fried one. The deep-fried one is worth a look but as a sharer for the table rather than as the only thing you’d eat for a main course. The topping options had been considerably reworked. For example their house pizza, called 1926, was completely different to the over-saucy steak-topped version I’d originally tried. I was lured in by the Diegoal, named in honour of footballer Diego Maradona. Maradona paraphernalia is all around in recognition of his time at Napoli where he “single-handedly” delivered two scudettos for the club. 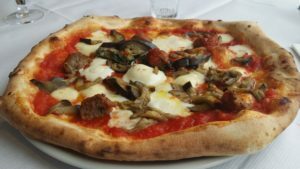 His pizza brought together mozzarella, aubergine and meatballs. Earlier that day I’d been getting a chuckle at an Andy Hayler review of a pizza place in London where he’d waited an inordinate amount of time to be fed. In my case I ordered at 12:32 and my pizza hit the table at 12:39. Speedy. The pizza was really good with toppings of pleasing quality and the base, although in a floppy style that makes my preferred fold and shove faceward method a challenge, was light and springy. I enjoyed the aromatic and soft meatballs, so reckoned they were worthy of Ball Quest recognition. So overall, it was good to find 1926 on a surer footing after a rather wobbly start. It very positively adds to our already impressive range of pizza purveyors in the city. It has a bit to go to rival Glasgow’s Paesano for excellence in this style of pizza but if they keep on their current improvement track things will be plenty good enough to build an appreciative audience.